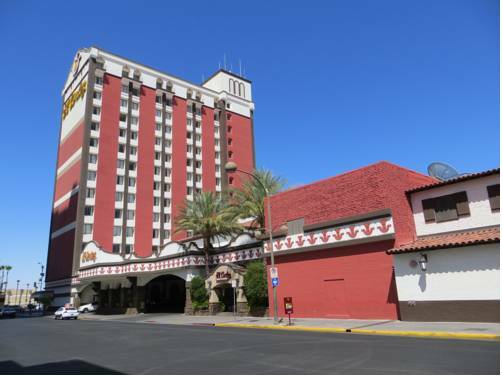 A full-service hotel/casino property located in the heart of Fremont Entertainment District in Downtown Las Vegas just two blocks from the Fremont Street Experience. The El Cortez offers spacious beautifully appointed hotel rooms 2 restaurants including our Flame Steakhouse and a 24-hour Cafe Cortez food court barber and beauty shop two parking garages with ample free parking spaces valet parking room service from 7am to 10pm and an action-packed casino featuring all of the latest slot and video games blackjack craps roulette poker mini-baccarat live Keno and race and sports betting. Voted Best Downtown Hotel in 2009. Tower and Vintage rooms are all non-smoking. Downtown Las Vegas 2 miles north of the stripCorner of 6th and Fremont in the Fremont East Entertainment District. A storage yard for all of the old and forgotten signs of Las Vegas, now packaged as a collection of neon and city history. Self-guided tours by day; guided tours by day and night. "Brilliant!" show after dark reanimates 40 of the defunct signs. < 1 mile from Las Vegas. A Vegas skyline landmark, the Stratosphere Tower -- locally known as The Strat -- offers terrifying rides 80-plus stories above the city. ~2 miles from Las Vegas. Recently moved to an expanded facility, displaying the collection of a Vegas aficionado. Classic pinball machines, rifle and other arcade games from the 1950s-1990s. ~5 miles from Las Vegas. 26 feet tall and metallic, Dream Machine has been compared to a jellyfish, an alien fungus, or the mushroom cloud of a nuclear bomb.